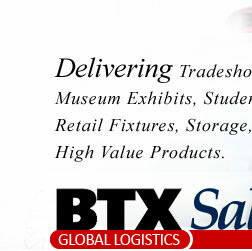 Exhibit Management Shipping Transportation Tradeshow Exhibits, Fine Art, Museum Exhibits, Storage and Logistics"
BTX Salt Lake City strongly feels that our success has been built upon the ability to recognize and meet the special needs of our clients. Working closely with our customers we tailor-make programs that work within their organizational structure. Specializing in art, museum and corporate tradeshow exhibit arenas. BTX Salt Lake City feels it is important to offer exhibit transportation that carries with it the support of an experienced customer service team. Our exhibit venues are backed up by the well seasoned employees who know the needs and ideals of each industry. Our experience in the tradeshow exhibit field goes back as early as 1970. 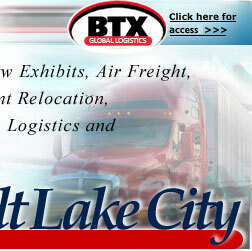 BTX Salt Lake City has become a leader in the transportation industry. Whether your needs require the full logistics of setting up the transportation of each exhibit, inventory control of those tradeshow pieces or a simple matter of storage, BTX Salt Lake City can easily service your needs. We extend our services from Air freight to International shipping. From crated or blanket wrap small pieces, to multiple truck loads of exhibits. BTX Salt Lake City has the answers to your needs. We would invite you to take the tour of our services. After you have become familiar with BTX Salt Lake City, inquiring for more information is as simple as going to the forms tab in the upper right hand corner of this page, matching and clicking on what type of service you would like us to price out for you, then clicking on submit. Or, if you wish you can simply go to the "Contact Us" tab in the same location and click on one of the management email addresses, and submit your inquiry with your return contact information. Thank you and we look forwarded to hearing from you soon. ï¿½ Copyright 2001 - 2006, BTX Salt Lake City Transportation Logistics Solutions. All rights reserved.